First of all, keep in mind that all of this is purely my opinion. I'm not saying that any of the following vehicles are "the best." I'm merely showing you my personal group of favorite 4x4s from movies and TV. There were plenty of competitors, but only 10 could be chosen. So, with that in mind, here are my Top 10 favorite famous 4x4's. There are a lot of f's in that sentence, aren't there? 10. The Road Warrior F-100 "Cobra"
This heavily modified Ford had a role in the popular Mel Gibson film The Road Warrior. To capture the movie's post-apocalyptic look, the vehicle needed some peculiar modifications. Hood-mounted spotlights are cool, as are the Cobra decals on each side. A boat windshield makes for an interesting touch, and the speargun does plenty of damage. While this film had an array of dune buggies, and similar 4x4's, this one stands out above the rest. In the sequel to Jurassic Park, the main characters need to traverse tough terrain and avoid ferocious dinosaurs. Naturally, a rugged 4x4 is a neccessity, and the two Mercedes ML SUV's used in the film fit that description quite nicely. Both vehicles receive camouflage paint, custom 4x4 modifications, and other tactical features. Sadly, neither of the vehicles survive the island. However, they get some decent action on-screen, and make a great addition to this countdown. Jim Carrey is all-out Jim Carrey in this somewhat humorous film. The film's vehicles are the real stars, however. Several classic Land Rovers are used and abused, as well as several Jeeps and a Willys or two. But this S-10 Monster Truck used by Carrey's character is definitely the coolest. Spotlights, giant tires, and exhaust pipes sprouting through the hood make this vehicle look like nothing else. Plus there's the zebra paint scheme, just to liven things up. The movie is okay, but this truck really makes it. Tough guy Dwayne "The Rock" Johnson plays federal agent Luke Hobbs in the fifth entry to the adrenaline-pumping Fast and Furious series. To track down escaped fugitive Dominic Toretto, Hobbs needs to chase, smash, and shoot his way through Rio de Janeiro. So he gets behind the wheel of an Armet Gurkha F5. Throughout the film, this machine is plowing through walls, dodging explosions, and frightening the general public wherever it goes. All in all, it's an unstoppable force worthy of this list. Sean Connery is cool. Hummers are cool. Sean Connery in a Hummer? Incredibly cool. In The Rock, Sean Connery "borrows" this sweet Hummer to evade Nicholas Cage, who gives pursuit in a yellow Ferrari F355 Spider. The chase takes place in San Francisco, which is ideal for an interesting chase scene. Out of all the Hummers that could have made the list, this one stands out. It plows through a taxi cab, jumps through a truck full of bottled water, crushes a Beetle, obliterates a meter maid cart, and causes the destruction of a trolley. It's absolutely unstoppable. This is definitely one of the coolest vehicles on the list. This customized black Chevy is about as ominous as a vehicle can get. As a matter of fact, two other 1980's films, Nightmares and The Hitcher, both feature black Chevy trucks with spotlights mounted on them. 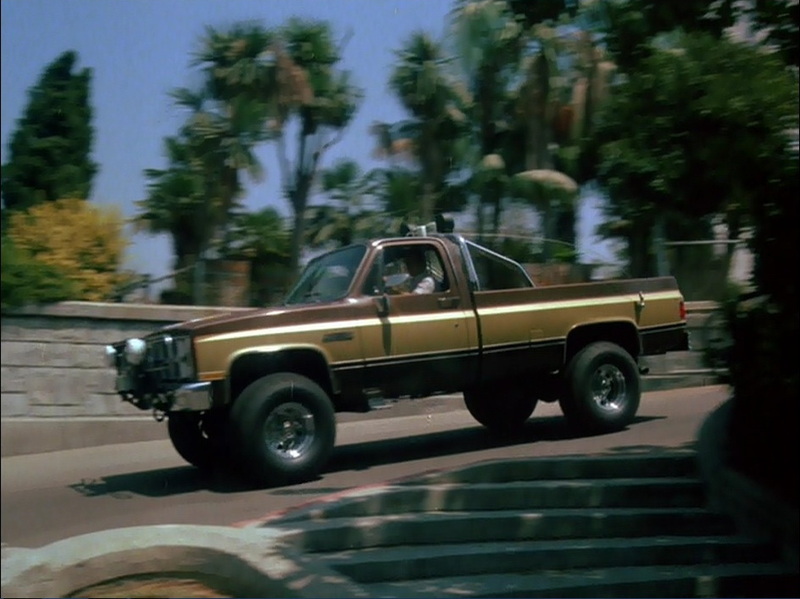 In this movie, though, the truck is used by Kyle Reese and Sarah Connor as they attempt to escape the Terminator, who is pursuing them on a motorcycle. In the end, the truck gets totaled, but that doesn't make it any less cool. In Raiders of the Lost Ark, Harrison Ford stars as the iconic Indiana Jones. 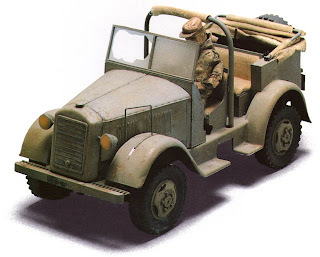 A key scene involves Jones hijacking the Ark of the Covenant from a large Nazi convoy consisting of a black staff car, the truck holding the ark, a small troop car with a mounted machine gun, and a motorcycle with a sidecar. 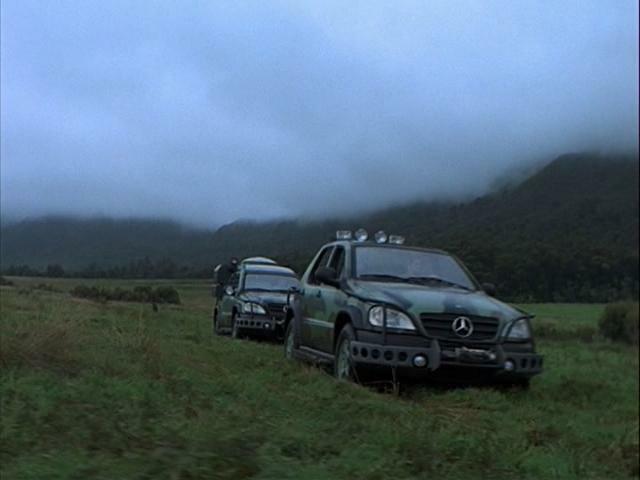 The troop car is custom-built for the film, and based loosely on a Mercedes Benz G5. The above picture shows a model of the car due to the fact that it is hard to see the vehicle fully in the film. In the end, it gets shoved off a cliff. This car and the truck later reappeared in the film Top Secret! In The Fall Guy, Colt Seavers is a man with two very different lives. On one hand, he's a stuntman, so he knows a thing or two about cars. However, he also works as a bounty hunter, which means he needs a tough ride to rely on. So what is his ride of choice? It's a modified GMC K-2500 pickup, and it's also number three on this list. This truck is incredibly tough, and has many features characteristic to custom pickups of the era. Lift kit, spotlights, brushguard, rollbar, it's all there. It's stylish, yet simultaneously effective. Which means it's got enough going for it to make the top three. This is one cool truck. This is possibly one of the coolest vehicles ever, in my opinion at least. In the light-hearted monster movie Tremors, a subterranean creature is slaughtering anything that moves in a small valley town. Valentine McKee and Earl Bassett are a hardworking pair of handymen who are forced to help the townspeople survive the underground onslaught. Their vehicle needs to be a tough truck capable of navigating the rural landscape with ease. 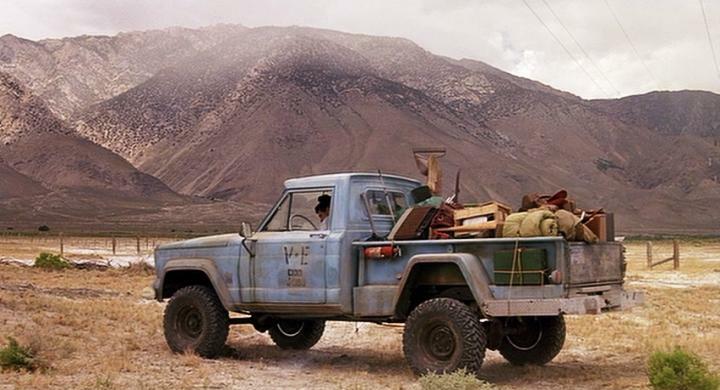 The 1963 Jeep Gladiator they drive is perfect for the job. Not only does it survive the movie, it reappears in the sequel. 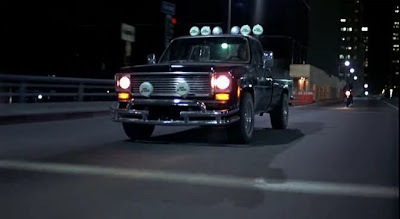 This is one of the coolest trucks ever to be onscreen, and definitely earns its spot as number two. I know, I know, ANOTHER Jeep truck? Repetitive it may be, but something about the design of these vehicles is just so perfectly representative of 4x4's. Rugged and dependable, yet stylish in their own special way. Anyway, in Twister, stormchaser Jo Harding drives this awesome yellow Jeep J-10 Honcho. It gets used early-on in the film to chase a tornado, but sadly it ends up totaled. That said, the action involving this vehicle before its destruction is quite thrilling. It has a host of modifications that are realistic and feasible for an actual car to have, yet enhance its off-road specialization. In short, it's my personal first place 4x4. So that's that. Many vehicles had to be cut, all of them good. The Dukes of Hazzard Jeep, the Road House Bigfoot, and the Sahara Cherokee were all close, but were weeded out towards the end. Overall, I'm satisfied with the list, although I'm sure everybody has changes they would make. If you have any suggestions or comments, let me know. And finally, a big thank you to www.imcdb.org for providing the pictures. Stay tuned, there's much more to come!